Gianni Cleopazzo of Sartoria Vergallo is one of those tailors that is always interested in new ideas. 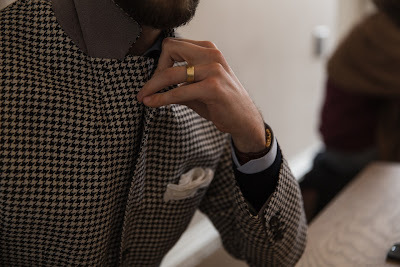 He was intrigued, therefore, by the bells and whistles I suggested putting on this houndstooth jacket we made last year. I wanted, primarily, to give it a casual touch, so we put grey suede under the collar and in the overlap of the cuff – to create very subtle changes in texture. The change under the collar will be much more obvious, of course, when it is popped up, and we deliberately cut the foreparts of the jacket so that it buttoned all the way up, with a high third button and then a fourth under the top of the lapel. 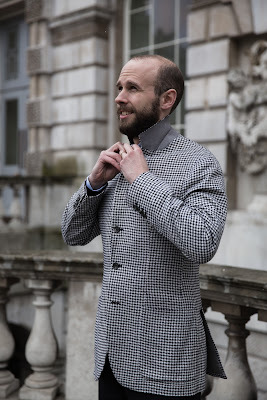 Most ready-to-wear jackets use an extended collar or throat latch to achieve this, but that is rarely satisfactory – the collar is often uncomfortably tight and the lapel below it bows open. Far better to make use of the lapel buttonhole and put a button underneath the opposite side to attach it to, cutting the lapels of course so that they join cleanly up the chest. Shirt, sweater and trousers as on previous posts in this series. You can follow the discussion on Sartoria Vergallo houndstooth blazer by entering your email address in the box below. You will then receive an email every time a new comment is added. These will also contain a link to a page where you can stop the alerts, and remove all of your related data from the site. 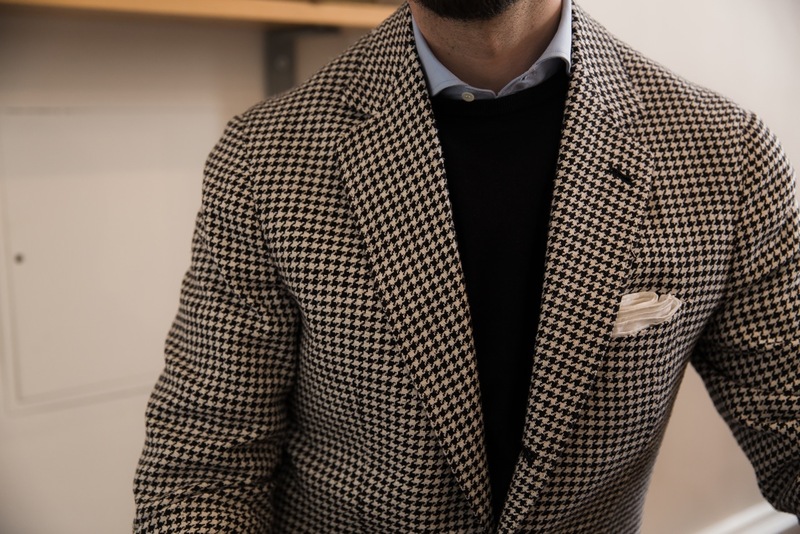 Normally I’m not a huge fan of this color of houndstooth but the ensemble you put together makes this look terrific. And I really like the extra functionally features built into the jacket for practical use. Very nice! how much simon for a jacket like this from SV? do you every worry that the white in the black & white Houndstooth will get dirty? It would be 1300 euros Raj. And no, I don’t really worry about the white. also any tips about buying vintage cloth .. how do you know that your getting a fair price when there is no point of reference? do you just have to trust the seller? You look more smiling and less like you are trying to be a male model. It is a much more natural, elegant and fitting look. What color are the sweater and trousers? That is a beautiful jacket, congratulations. Personally I am more fond of a structured shoulder, I think it fits lean people (like myself) better. What are your thoughts on that? My experience with Graham Browne has not been that good. I think he is much overrated. They do not have time to make a good product and there have been issues with half of the commissions. E.g. out of the 6 pairs of trousers they made for me, only half of them fitted according to the paper pattern. There were big deviations from pair to pair. The jackets they made had several critical issues, one was much too wide at the hips, another had holes in the pockets, one was a 3 button instead of a commissioned 3-roll-2, one sleeve was 1 inch longer than the other setc. A good tailor would never have let these jackets leave the house. I found GB friendly and open to debate this and help you and try to fix the problem, but only if you insisted and pointed at issues yourself. There were so many things they should have seen themselves, but they seem to take the risk. Things just did not get better over time. Sure, what you pay is what you get, but GB is certainly not the deal and that is what this blog seems to suggest. Sorry Simon, I hope this criticism is okay. I just found reality to be much different and thing just got worse with GB. Perhaps they have had too much success recently? No problem Frank, it’s all welcome. It’s probably fair that GB aren’t as consistent as other places, probably due to the volume they do to keep prices down. Could you comment on the lead time for these garments? As I go to replace my Kiton, Purple Label, Brioni garments, this is something that I will take into consideration. I like the price point on the Solito and SV, but if they take ages to make, then I might look elsewhere. Should three to four months be the standard range for which a bespoke item to be made in? That sounds about right, but it might be slightly longer if the tailor doesn’t come every month and for the first jacket from anyone it’s worth having an extra fitting. Solito is now coming regularly and Vergallo has for a while, so they should both be pretty quick. Contact them yourself to get a lead time confirmed. How content are you with the fit of the jacket? No collar gap when moving etc.? I recall you uttered some general criticism of Italian made fits. It’s good. I don’t remember that general criticism? To Jerrell Whitehead – For first time customers Vergallo usually require 4 visits. During the first visit, measurements are taken, cloth and trimmings are chosen and the style of the garments is confirmed; they then require two further visits for fittings. Last visit is just collection, unless one more fitting is required. Overall it takes twelve to sixteen weeks depending on your availability and on the time of year (they visit London once a month, except August). a very nice jacket. I have 2 jackets of liverano, I love them. Now from the italian tailors in particular I like De Togni in Verona. Did you never had a jacket from them? No I haven’t. How would you compare the styles? well…. I know what I asking to De Togni but I not sure what is the De Togni style… anyway, in my opinion De Togni has something in common with that of Liverano. De Togni prefers a tight cut chest but not too close, the waist line is high, the sleeve is rather narrow. The shoulder is natural, without padding if possible in order to follow the natural shape of the shoulder. 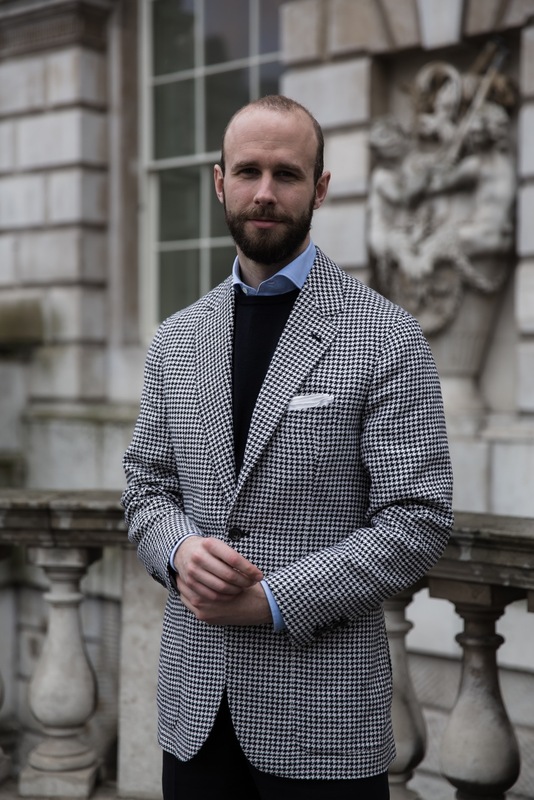 The armhole is tight (….or I ask him a tight armhole…) As other North Italian tailors, they prefer less structured shoulders than the English but not completely concave ones as those of Naples. The jacket tends to be cut at traditional length. thanks for you blog, ever very interesting. IT MADE UP WELL SIMON, PERHAPS I SHOULD HAVE KEPT IT! What kind of shoulder does the jacket have? It seems to be soft but not a shirt sleeve. Would you say it still looks casual? 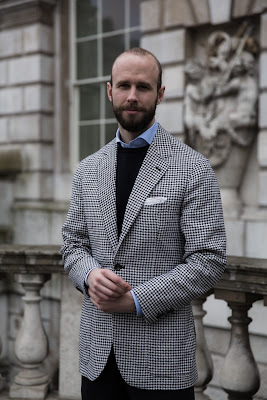 Does the sleeve head look very different to your Neapolitan jackets? I think in the past, you’ve said that non-Neapolitan tailors struggle to achieve the Neapolitan shirt sleeve shoulder. Got you. As always thanks for the response. I’m having a few things made by Gianni. He seems a very capable tailor and also willing to accommodate customer’s requests. However, when trying something new, it’s always nice to see someone else has received what I’ve asked for. Plus being able to ask questions is invaluable! One thing I have noticed on your vergallo jackets is that he appears to cut a large patch pocket. Is this just the camera? How does the pocket size/shape compare to say Solito and Caliendo? Excellent. Looks like I’ll get what I asked for. Again, thanks for your help. May I ask about the length of the trouser cuffs, currently most of mine are 2 inches but yours look more impactful, although you are slightly taller than me. Simon, you never mentioned this buttoning solution again with any other jacket, so I wanted to ask how it has worked out in the long run? It’s worked out well – I actually had it on my Ettore de Cesare coat, which I mentioned briefly. Shoulder is interesting- like a Neapolitan but without the “waterfalling”? Fabric aside, would you wear a jacket in this cut with denim/ cords? Yes, in a more casual fabric. What are the suits like from Wainwright? How would it compare to my Solito suit?